Arrive in Mancos, Colorado. Visit the Anasazi Heritage Center in Dolores and explore narrow gauge railroad history at the Galloping Goose Museum in Dolores. After a relaxing dinner in Mancos, enjoy a leisurely walk through town with the historic walking tour brochure. Visit Mesa Verde National Park.Discover the spectacular cliff dwelling and mesa-top villages in this World Heritage Site. Enjoy dinner in the Park at the famous Metate Room with views that expand south to Shiprock, New Mexico and west to Arizona. Ute Mountain Tribal Park, CO. Ute Mountain Tribal Park presents you with the “other side” of Mesa Verde. Tours are led by Ute Guides who share their knowledge of both Ancestral Puebloan and Ute cultures, sites and rock art. Take your lunch, plenty of water as well as sunscreen and a hat. Sand Canyon Trail in Canyons of the Ancients National Monument There is a genuine since of discovery as you walk the trail and observe fragile cliff dwellings tucked away in sheltering alcoves. Do your part to preserve these ancient structures for future visitors. Take pictures only. 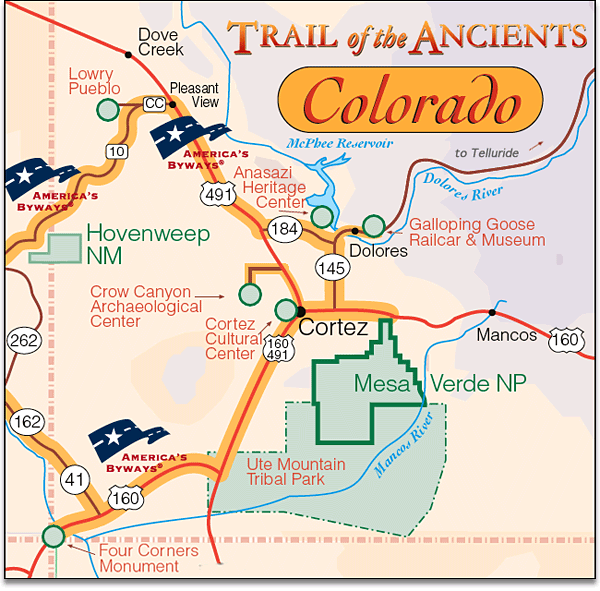 Check in with the Mancos Visitor Center to get a map and learn details. Stop by the local wineries on Road G (McElmo Canyon Road to the locals) as you leave Sand Canyon. 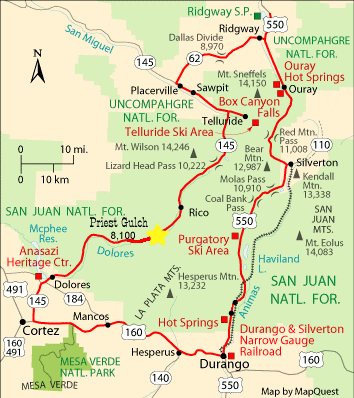 Drive to Durango Take a ride on the historic Durango and Silverton Narrow Gauge Railroad to Silverton where you can explore an old west mining town, have lunch and enjoy a little shopping. When you return to Durango be sure take a leisurely walk along historic 3rd Avenue. The Strater Hotel is the queen of Main Street and well worth a visit. For a fun evening out try the Bar D Chuckwagon. They serve up a great meal with a terrific western stage show. Return to Mancos for a well-deserved rest. Travel to historic Telluride and Ouray Grab an early breakfast at a local café and hit the road. Your destination is Telluride via the Skyway. There are numerous trails along your way and you will want to stop for photos and to hike. Telluride is a National Historic District and is known for its Victorian architecture, mining history and spectacular scenery. For the best views take the gondola ride from town to Mountain Village. Advance your journey to Ouray with a stop at the True Grit Café in Ridgeway. The well-known John Wayne movie was filmed in the region. Your next adventure – A drive over Red Mountain Pass Known as the “Switzerland of America,” Ouray has numerous natural hot springs. Be sure to bring your swimsuit. There are lots of options for hiking and jeeping in the high country. Some lodging offers their own private hot springs with vapor caves or even the option of a massage. Enjoy your evening in Ouray and be ready for your trip over Red Mountain Pass and on into Silverton. Allow for plenty of time to drive this route. The winding mountain roads offer lots of photo opportunities and you’ll want to stop at the mining exhibit on the north side of Red Mountain Pass. Enjoy the forest vistas, waterfalls, deserted mining towns and the possible wildlife along the way as you return to Mancos. The Mancos Valley Chamber of Commerce and Visitor Center is open 11 am - 3 pm Monday thru Saturday. Click here to contact the Chamber. Mancos Valley Chamber of Commerce © 2019. All Rights Reserved.